Load Cells are incorporated into the trailer chassis design to support the weighing platform and thus measure the load. 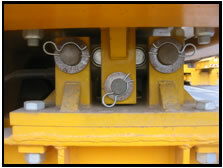 The Load Cells are digital; weight calculation is done within the load cell itself and is transmitted to the Trailer Computer in digital format. Load Cells range from 10 to 200 Tonne capacity to suit the application. 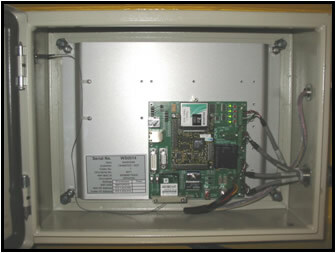 The Trailer Computer is an embedded PC with a Windows CE operating system. It is built into a heavily armoured area of the trailer and gathers digital load information from the load cells and provides real-time mobile weighing over the wireless network. Our ScrapMan weighing systems offer excellent accuracy and repeatability; typically +/- 0.25%. We have a long-standing association with Seacom who have an enviable track record in the design and manufacture of rugged, heavy-duty trailers for steelworks scrap baskets (and other applications) up to 200 Tonnes payload. Working in partnership with Seacom, we can provide a reliable and accurate mobile weighing system to give the steelworks accurate scrap-loading data.